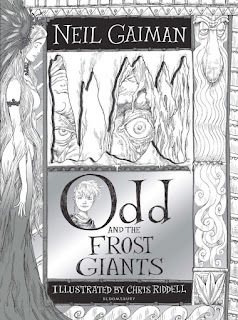 Neil Gaiman and Chris Riddell are continuing to build their reputation as one of the best author–illustrator combinations. Matching great writing with exquisite illustrations, all presented in a truly stunning format, Odd and the Frost Giants is a book to treasure. My heart started racing as soon as I saw the silver foil and die-cut cover. When I realised silver ink was used throughout as well, on thick glossy paper, I almost trembled with happiness! It's production values like this that can make a book a work of art. On to the story, which happily more than lives up to the expectations set by the presentation. Odd is the son of a Viking. His name means 'the tip of a blade' and it's supposed to be lucky. But his father has drowned trying to save a pony that fell overboard during a Viking raid, Odd has managed to shatter his leg trying to use his father's axe and now needs a crutch to walk, and his mother has remarried a man who isn't particularly fond of Odd. So luck seems to be in short supply. But none of that can stop Odd smiling. In fact, he smiles so constantly that it actually annoys the villagers. With not much to keep him at home, one morning Odd dresses in his warmest clothes, steals a side of salmon, takes his axe and crutch, and heads out into the snow. Before long, he meets up with a fox, who leads him to a bear trapped in a tree, kept company by an eagle. It's the start of an extraordinary adventure for Odd with three animals who are most definitely not what they seem. Drawing on Norse mythology and the legends of the gods, this is a page-turner that will not only captivate eager readers, but also appeal to reluctant readers who might have met Norse gods such as Thor and Loki through films in the Marvel franchise. It's another triumph from the Gaiman–Riddell team.